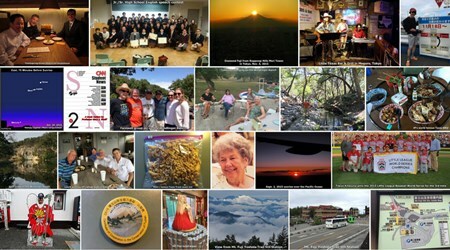 This page shows archived posts for Gary J. Wolff's blog from October-December, 2015. It's been a great year! Thanks for being a part of it. Best wishes for a healthy & prosperous 2016, the Year of the Monkey! Dec. 23, 2015 - The 60th anniversary of "NORAD Tracks Santa"
Sixty years ago a Sears department store in Colorado Springs placed an advertisement in the local paper which told children that they could telephone Santa Claus and included a number for them to call. However, due to a typo in the phone number, calls instead came through to the North American Aerospace Defense Command (NORAD), then known as the Continental Air Defense Command (CONAD) Center. So as not to disappoint the children in Colorado Springs, the colonel in charge that night told his staff to give all children who called in a "current location" for Santa Claus. The tradition continues to this day. Now, in less than 24 hours (5 pm on Dec. 24 Japan time), Santa will begin his 24-hr journey to deliver billions of presents to eager children around the globe. The technology has improved greatly thru the years, and it's truly phenomenal to view the 3D animation of his travels. 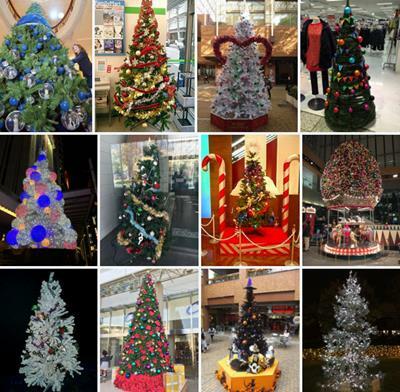 The "NORAD Tracks Santa" website videos page is generally updated every hour, when the "Santa Cam" videos show CGI images of Santa Claus flying over famous landmarks in cities around the world. Get in on the action by visiting the NORAD Tracks Santa website, where you can play games, listen to music, view videos, shop, and link to downloadable Santa tracker apps for your mobile device. 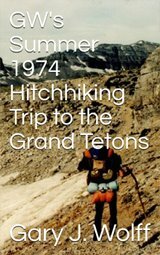 Below is a Santa Cam video of Santa when he blasted past Mt. Fuji in Japan 10 years ago at a speed calculated to be greater than 100 times faster than that of Japan's shinkansen bullet train. Kazutoshi, a very talented musician & one of my university engineering students, has composed a song named "Mr. Wolfman" and posted it to his SoundCloud channel. He said it was inspired by...yep, you guessed it...yours truly. And by all means, don't miss the personal greeting at the very end of the song by Mr. Wolfman himself! Thanks, Kazutoshi, for sharing!! Well done! Back by popular demand, the famous Santa Mickey thrills kids worldwide with Xmas carol karaoke practice. Kids....by all means....DO try this at home!! All 5 videos are in a playlist and will play continuously, non-stop. Or click on the playlist symbol in the upper left corner above to select the other 4 videos. OR...play the entire playlist in new window here. Watch Danny MacAskill, Scotland's most famous daredevil, ride his bike across the rooftops of Gran Canaria, one of Spain’s Canary Islands off northwestern Africa. This guy is AMAZING, as he balances and hops across rooftops with a GoPro strapped to his head!! Boys & girls....DON'T try this at home! And don't miss the grand finale @ the 4:25 mark! 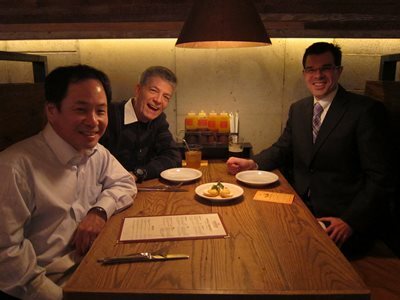 ...and fellowship with 2 of my all-time favorite guys on Thanksgiving Day in the Smokehouse restaurant. In our efforts to achieve success in our everyday lives, we will all invariably encounter many dark moments of self-doubt and fear of failure along the way. And it's always a special challenge to maintain our self-worth in spite of the doubts and discouragements of others, particularly from those in positions of authority.... parents, teachers, coaches, bosses, etc. In the process, if we lose our confidence to take risks, our chances for achieving success are severely diminished. But without risk, there can be no lasting success. And so many great successes have been built upon repeated failures and the lessons we learn from those failures. Perhaps it's time for us to turn off the TV, stop checking our Facebook news feed every few minutes, get off the sofa, stop being afraid, and go conquer our dreams. The very touching 1-min. video below puts it all into the proper perspective. In short, "If you've never failed, you've never lived." 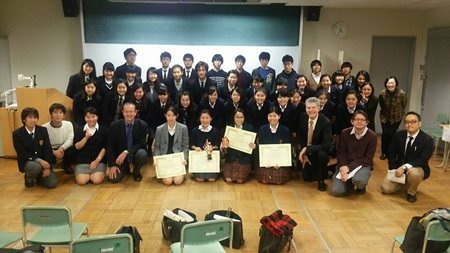 "One of the best motivational videos I've ever seen"
Last Sunday I had the pleasure of serving as a judge in the Musashi Junior & Senior High School English Speech Contest, organized by the All-Japan Inter-High School English Speaking Societies (ESS) Union. ...@ the "Little Texas" honky-tonk in Meguro, Tokyo on Thurs. Nov. 19, 2015! Yee Hah! The spirit of Texas rocks on...DEEP...in the heart of Tokyo! 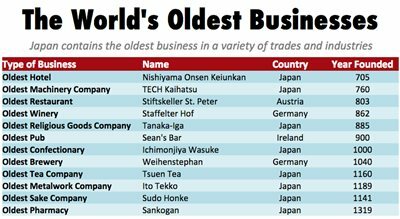 Nov. 15, 2015 - Did you know many of the world's oldest businesses are in Japan? In an era when Silicon Valley companies rarely survive for more than a decade and as the average lifespan of multinational corporations has gradually declined over the past 30 years, Japan’s centuries-old businesses have defied the odds by surviving the formidable test of time. Of the 967 businesses worldwide founded prior to 1700, 517 of them (53%) are located in Japan. Of these 517 businesses, the 3 most common trades are sake (85), confectionery (70), and hotels (64). Many of the other 517 businesses founded prior to the year 1700 are related to Japanese culture: things like taiko drums, paper lanterns, dolls, brushes, etc. Because of Japanese society's continuous endorsement & nurturing of traditional industries of great cultural importance, these kinds of businesses tend to enjoy centuries of longevity. Japan contains 8 of the world’s 10 longest-running businesses (all founded prior to the year 800), including the world’s oldest hotel, Nishiyama Onsen Keiunkan, a hot spring that has been in continuous operation since year 705. Japan also has the world’s oldest sake brewer (Sudo Honke, year 1141), religious goods company (Tanaka Iga, year 885), confectionery (Ichimonjiya Wasuke, year 1000), and, until recently, construction company (Kongo Gumi, year 578)....all confirmed by the Guinness Book of World Records. Other factors in the longevity of Japanese businesses include the isolation & economic stability of the country between the 1600s & 1800s, the longest human lifespan on Earth, the world's 3rd lowest infant mortality rate, no financial risk-taking, being sensitive to the environment, and the tendency of company managers to focus more on the welfare of their employees rather than on the economic activity of producing goods and services. I got lucky on an absolutely gorgeous day! Roppongi Hills is nearly an hour from my home and it costs ¥1800 (~$15) to enter the 52nd floor Tokyo City View observatory, but as they always say: "Persistence sometimes pays off." 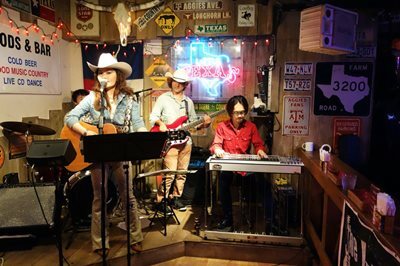 If you're looking for an authentic Texas honky-tonk in the world's largest metropolis, go no farther than the Little Texas Bar and Grill in Meguro, Tokyo. Live country music, cowboy hats & boots, line dancing, chicken-fried steaks, Texas license plates on the walls, & its gracious Japanese owners Takeshi Yoshino & wife Natsuco all make this amazing place reminiscent of the old cowboy bars of the South and Southwest U.S. Recently I was alerted to a wonderful story written by NPR International Correspondent Elise Hu, an award-winning journalist based in Seoul, Korea, who has done an excellent job capturing the magic of this must-see Little Texas bar in a piece for NPR's All Things Considered radio program. In Elise's NPR story, you'll be able to see more pics, listen to the audio track, and even link to a video of the bar owners receiving "Honorary Texan" certificates signed 4 years ago by then-Governor Rick Perry. The Little Texas website, where you can view photos, the menu, & a schedule of upcoming live country music gigs, is here. Yee Hah! CNN Student News, Vol. 2 is the second in a three-part textbook series and is based on CNN Student News, a 10-minute, commercial-free, daily TV news program that presents current events and issues in a simplified format, targeting middle and high school students. The show airs weekdays throughout the U.S. school year and is supplemented by the program’s website, both of which are accessible for free. 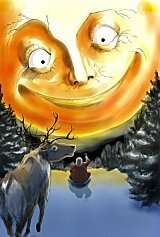 Each of the textbook’s 15 stand-alone, six-page units features a two-minute news story which has been previously broadcast and chosen by the authors to be of interest to young adult Japanese learners of English, complete with video, audio, and an array of discussion, vocabulary, and listening comprehension exercises. The DVD contains only two-minute videos for each unit and is furnished to teachers at no charge. 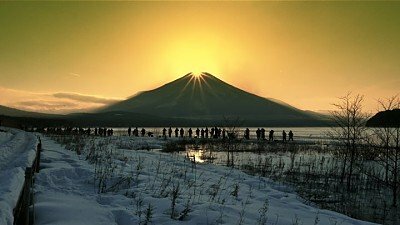 It's almost that time of year again when we'll have a chance in Tokyo to view an amazing phenomenon known as "Diamond Fuji," when the sun sets into the cone of Japan's tallest peak. From Nov. 1-16, if you're lucky, you might be able to catch Diamond Fuji from the top of some of Tokyo's tallest buildings & towers. 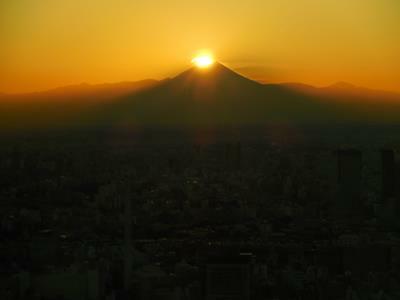 Click link above to see the best spots, dates, and times to view Diamond Fuji from Tokyo over the next few weeks. Wow, don't miss this amazing match-up of the 2nd & 3rd brightest objects in our night sky, viewable every morning 60-90 minutes before sunrise. In Tokyo, the best time right now is between 4:20 & 4:50 am. 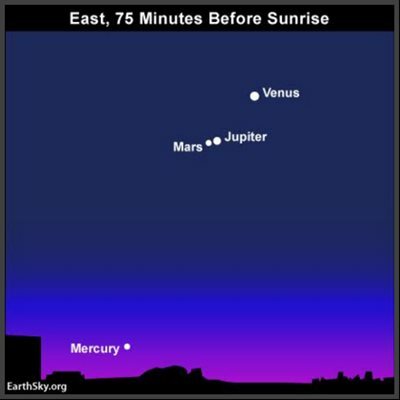 In October, we can view all 5 planets that are visible with the naked eye....Venus, Jupiter, Mars, & Mercury in the morning and Saturn in the early evening. The world's first glass-bottomed bridge opened recently in the scenic Shiniuzhai Geopark in Hunan, central China. It's the world's longest glass-bottomed walkway at 984 feet (~300m) long and is 590 feet (~180m) above the canyon floor below. Wow! More than 200 skydivers from nearly 30 countries traveled to Perris, California & set a new world record for the largest number of skydivers performing multiple sequential aerial formations. They jumped out of 9 planes from a height of 18,000 feet (~5486 m) and performed 2 formations. WOW!